When I first discovered TK’s recipe for simple roast chicken we (that is my household) thought we’d found the holy grail of roast chicken. I made it a lot, sometimes foregoing the addition of thyme sometimes not. It was always delicious, delivering crispy skin and juicy, flavorful chicken with minimal effort. But the oven afterwards was a mess and after one or two roast chickens it couldn’t be used for anything else without cleaning otherwise the oven smoked like crazy. After moving to a new house with double wall ovens, I used the bottom one for the chicken, but after reading about the perils of using the self cleaning cycle and alarmed at the heat it generated on the surrounding cabinetry, I stopped with roasting birds at 450 degrees. I cannot stand the mess that I have to clean every time. If I had staff to clean my oven I’d keep at it but since I’m the cook and the staff, I’m done - a reformed chicken roaster. 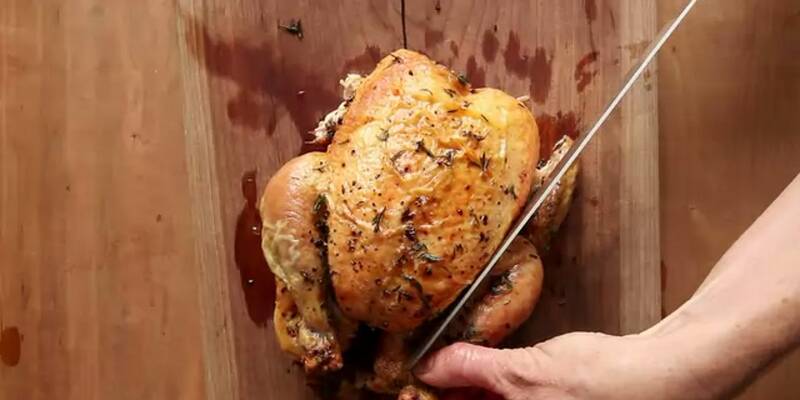 The first time roasting a chicken at 400 demonstrated very clearly what happens when roasting at 450 – all the fat that drains from the chicken as it is roasting vaporizes when it hits the hot pan and coats the inside of the oven. TK’s chicken comes out of the oven with little to no fat remaining in the pan, just the good chicken juice essence. A 400 degree chicken comes out just as good, almost as crispy, with but one “downside”: the roasting pan contains all the melted fat - none of it gets vaporized onto the oven walls. That’s the only tradeoff I’ve found, unless a clean oven is viewed as a tradeoff. Clean oven and chicken almost as good, sorry Mr. Keller but your chicken is unsuited to this home cook’s kitchen. Yes, that’s the one. It is nice but too messy. I’ve found that with Keller’s simple roast chicken recipe the key to avoiding the smoke detector going off is to put the chicken on a trivet on a pan and to fill the bottom of the pan with cut up or small whole potatoes. This reduced the oil splatter and smoke by a lot. I like waxier potatoes like yukon golds and new potatoes. As an added bonus, you get crispy potatoes roasted in chicken fat. What Keller’s recipe showed me was the value of roasting a chicken at high heat. I didn’t really follow the recipe other than to dry and salt the chicken and roast at 450. While delicious, I’m giving up the high heat, but sticking with the salt and occasionally adding thyme. Beyond that I ignored the rest of the recipe. Do report back on your results. Ferny, for what it’s worth, I seem to get a lot less smoke and mess from high temperature cooking in my Hamilton Beach countertop oven than I do when I use by big GE wall oven. The countertop oven has 4 functions; Bake, Convenction, Broil, and Rotisserie. Well, at least it seems like less smoke, but in all fairness to GE, when I bought this house 10 years ago and had to immediately remodel the kitchen if I ever wanted to eat again, the contractor I hired was not at his “full capacity,” shall we say? The oven is a GE Trivection, a fabulous oven that can do a 25 pound stuffed Thanksgiving turkey in a tad over 2 1/2 hours! But I can’t use it that much because I mistakenly told the general contractor I hired that I wanted the house to be “handicap friendly” in case I didn’t age as well as I hoped… How was I to know the general contractor had a serious problem thinking? He installed the oven at FLOOR LEVEL! Never hire an idiot if you can help it! Trust me. I was thinking along the same lines. I always roast chicken at 450 and without the big smoky mess. But I spatchcock it and roast over a bed of carrots, onions, fennel and thyme or lemons and onions. Even whole, it doesn’t mess up my oven much. I do it really often but I don’t think I clean my oven more than a few times per year. I cook outside half the year, though. Don’t the vegetables add moisture that causes the chicken to steam? The whole idea of TK’s method is to keep the chicken as dry as possible for crisp skin. I used to roast my chicken with olive oil and lemon juice, which gave a very flavorful result but flabby flesh and most definitely flabby skin. Now I prefer the purity of the chicken flavor you get when roasting the bird with nothing more than salt and pepper. I don’t know if the oven is the factor or not, but since it is a GE oven perhaps so. My previous oven was a Jenn Air, but even so the insides of the oven got terrifically soiled with grease splatters from chicken roasting, to the point that the oven window never got truly clear of baked on grease. The issue is not the smokiness from the chicken as it is roasting, but the smokiness from grease splatters from previous roastings. Too bad about your floor level oven - who ever would think that was a good idea? My ovens are stacked on top of each other and it is difficult to use the top oven comfortably - when the door is fully open (like when you want to remove something from the hot oven), it is at mid-chest level, making it impossible for me to reach across the hot door to remove what’s inside. I have to go at it from the side, which is borderline dangerous when the contents are a 9-quart dutch oven with a beouf bourgiugnon. At 450, buttered, seasoned and spatchcocked, nope, just the bottom is moist. The skin of the entire bird is like a flavored chip/crisp. Brushing with melted butter before seasoning really enhances the crispness, which is a must for me, the best part of any roasted bird. Flabby poultry skin or flesh grosses me out. Wonder if that is the case for me as well, my oven is not up to the temp. Ugh what a total mess! I pretty much followed it exactly and I got a house full of smoke and now I have to clean my oven! The chicken was good and the skin was crispy, but I completely agree with you. It was not worth the trade off. i was always a fan of high-heat cooking for birds til i found slow-roasting. the oven is set at 300 and a 4-5 pound bird takes about 3 hours. i didn’t ever do it in the summer because who the hell wants the oven on that long but now that cooler weather is here it will be back on the table. crispy skin, juicy meat, both white and dark. perfecto. I was starting to wonder … I don’t roast chickens any more and haven’t for decades, but (decades ago) they were a frequent flyer in our kitchen as back then chicken was still fairly cheap meat. I would never have considered roasting a chicken at such a high heat. 325F is the roasting temp I always used, and for a stuffed bird at that. I’m not a fan of skin - I always peel it off and discard it myself, I think it’s super-gross. But the rest of the family seemed satisfied with the crispiness of the skin. Do you blast it with high heat at the end or will that temp crisp up the skin? no blasting. generally i have air-dried the chicken at least 24 hours though. Very interesting. In all honesty, I’ve not experienced anything like the extent of mess you describe. I do the TK chicken roti prep 2-3x/month, and it’s not messed up my oven much. I get some smoke, but the messiest part is usually the pan searing of the bird’s back to push the dark meat doneness into alignment with that of the breasts. I typically use a CI skillet for the oven part of this prep, which is totally black. I am wondering if the emissivity is making a difference. What are you using? I use a stainless steel skillet clad on the outside with hard anodized aluminum; occasionally I use a plain aluminum skillet or a quarter sheet pan if the chicken is large. The skin on the chicken back does tend to stick to the pan, sometimes I dislodge it with a spatula halfway through cooking, at which time I also rotate the skillet 180 degrees. I can’t imagine the skillet makeup would make any difference. The drippings aren’t scorching in the pan, the fat from the chicken is vaporized (not sure that’s the word I’m looking for), leaving behind concentrated (and delicious) chicken essence. Wafflehouse, thanks for sharing your experience and confirming mine.